The relative peace and tranquility of the deserted Ho Chi Minh airport washed over us as we entered the arrival hall. Little did we realise what a rarity this would become in a city populated with 7.5 million people and 5 million motorbikes. 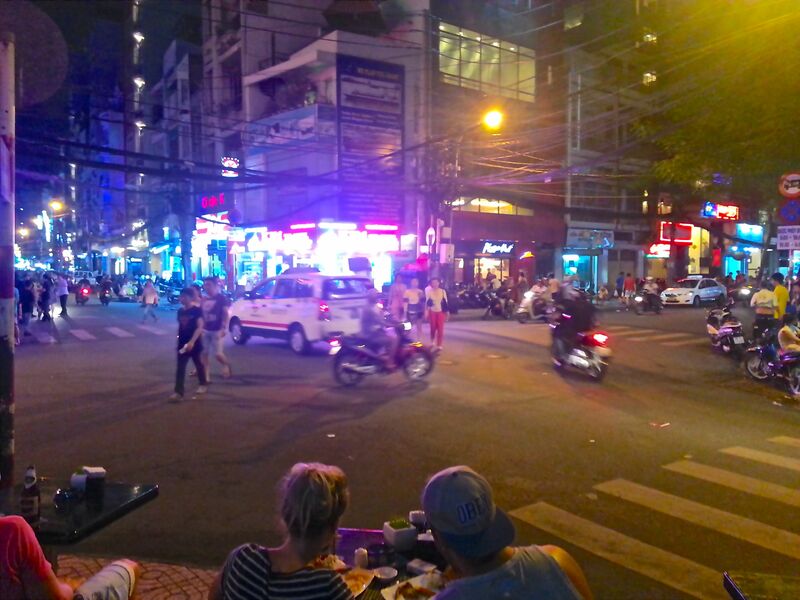 “Controlled” chaos would be a term I would apply to Ho Chi Minh city. Road markings are merely a guide and are not widely observed. Pedestrians, motorbikes, cars and buses honk, walk and interweave their way down the roads crossing paths and swerving to avoid one another. The lush green gardens and picturesque french inspired architecture is juxtaposed with the the dirty grey, broken footpaths. However, the city is a remarkable place – it breathes history. 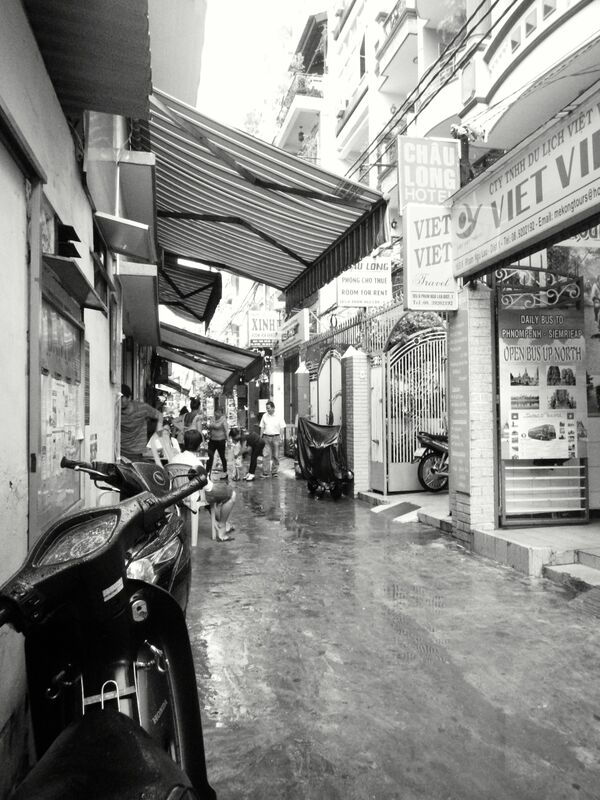 The French and American occupations of Vietnam have left elements of both cultures being assimilated into daily Vietnamese life. Coffee and cigarettes are a staple of the people of Vietnam, and virtually every restaurant serves french fries and burgers. South Vietnam was once the stronghold of first the French, then Japanese, French again and then the Americans during the atrocities of the Vietnamese war. In the past Vietnam was divided into two separate regions; North and South Vietnam. Ho Chi Minh and his move to reunite Vietnam as an independent country was thwarted at every step by foreign governments attempting to stop the wave of communism. 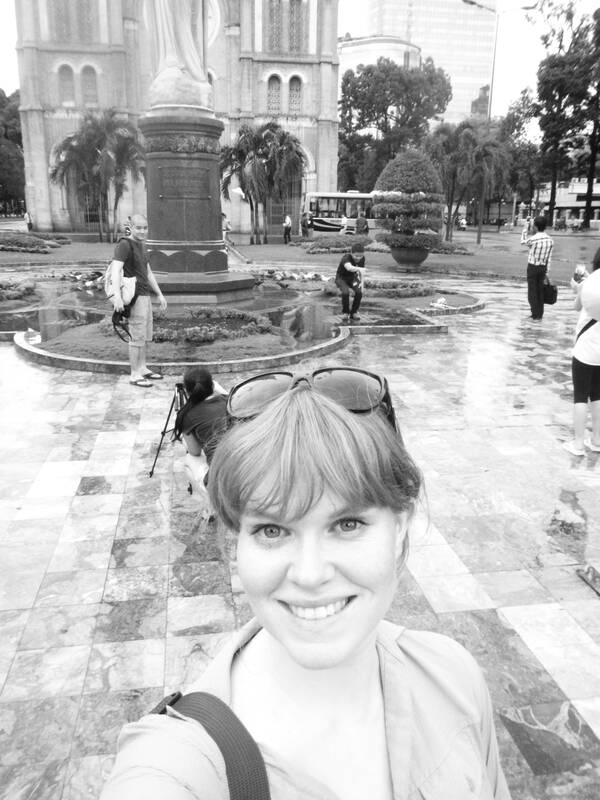 For history lovers, Ho Chi Minh city offers visitors the opportunity to delve into the Vietnamese perspective on the war. Craig and I have both been enjoying taking some time out with a good cup of coffee and have spent a few mornings chilling in coffee shops. 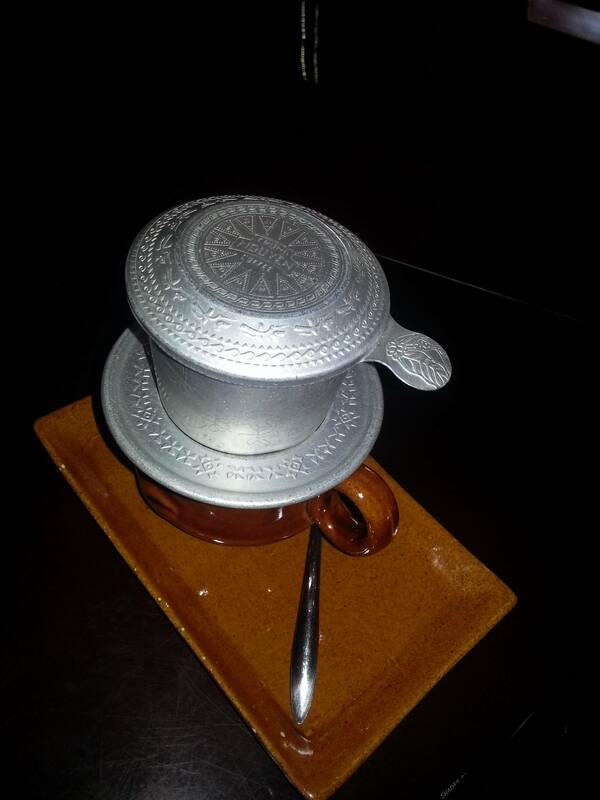 Vietnamese coffee is grown in the central highlands of the country near a place known as the Annam Plateau. The coffee is dripped through a filter into a cup filled with a quarter as much sweetened condensed milk. From there the coffee settles and mixes and is delicious served over ice. 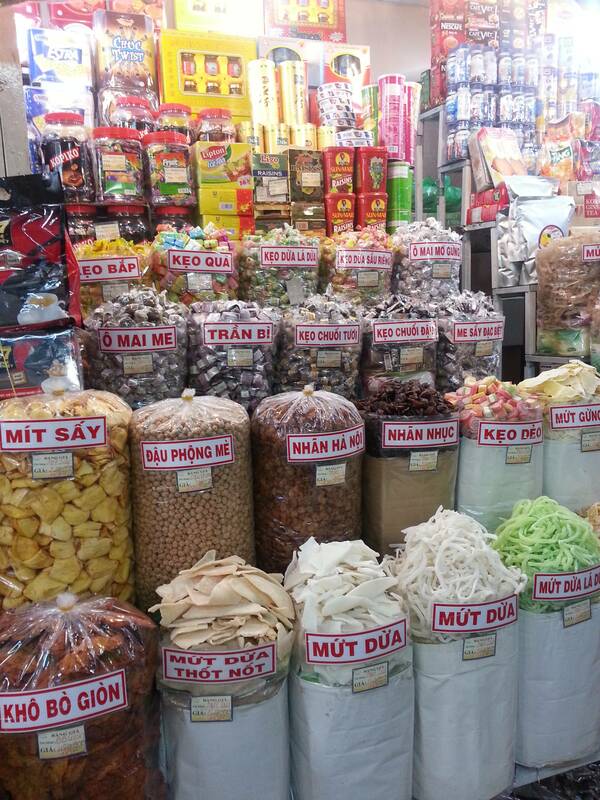 Another famous feature of Ho Chi Minh city is the Bến Thành markets. Located in district one, it is the oldest market in the city and one of the only early structures still standing. The markets specialise in clothes, street food and handicrafts, with over 300 stalls in a very small space, it feels like you are walking into a warm swimming pool. As you wander through the market, you are overwhelmed with the colour, and immense amounts of, well, STUFF. Vendors seem to be everywhere and ready to do their uptmost to get your money and attention. Hands appear from nowhere and beg you to come and look at their wares. I shake my head, trying my best to move away. I slowly back away and turn around, only to find another vendor repeating the same thing. Hold onto your bag tight if you come here, it is a well known spot for pick pockets. In fact if you can bear it, carry very little, and conceal everything. 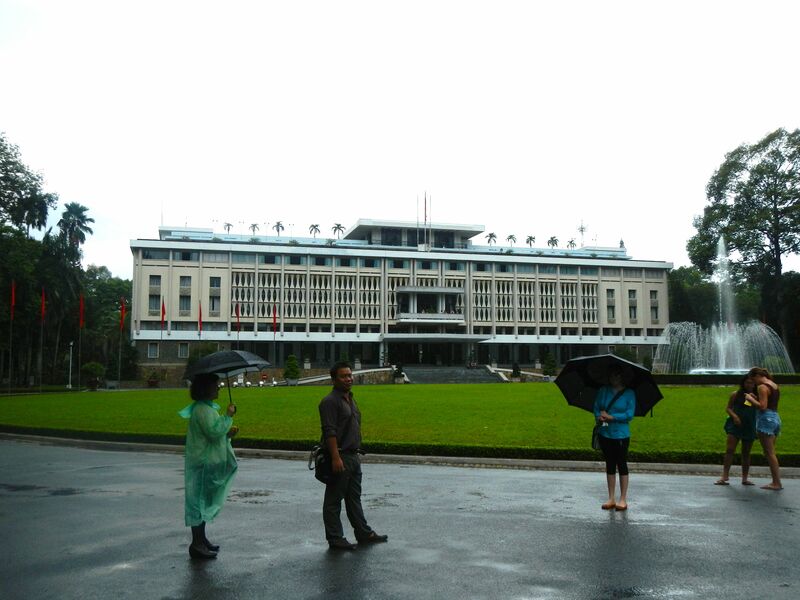 Not far from the Bến Thành markets, is the Reunification Palace. 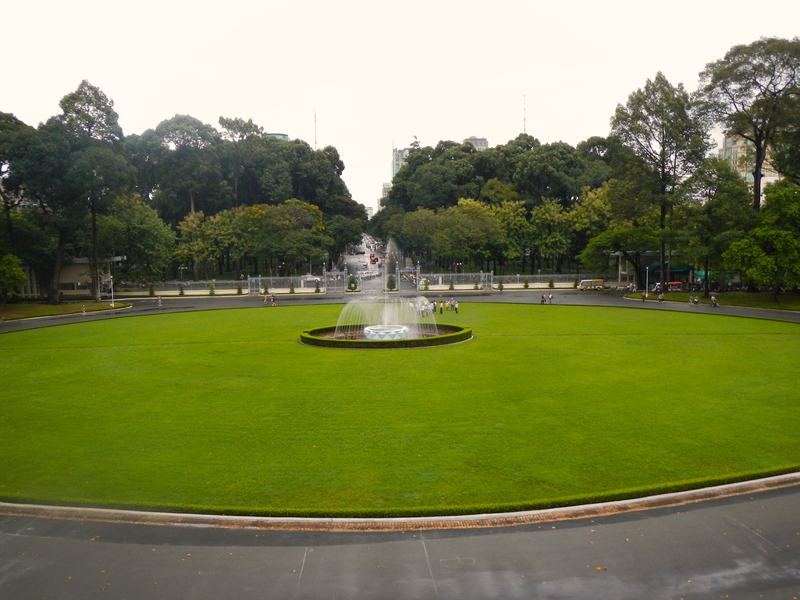 The palace was originally the presidential residence, and was the site of the end of the Vietnam War during the fall of Saigon in April 1975, after a North Vietnamese tanker drove through the gates. The palace is now used as an events venue and has over 100 rooms. The four stories, contain numerous dining halls, meeting rooms and bedrooms. The most interesting of these, are the war rooms in the basement; thick walls encase a military headquarters with several radio rooms and military strategy stations. 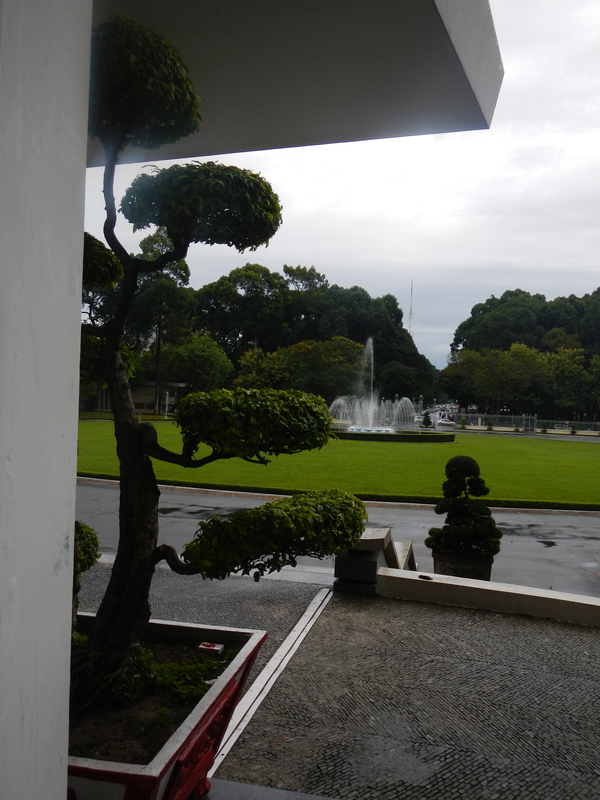 The grounds themselves are lush, Bonsai trees adorn the entrance to the palace and a large fountain welcomes you to the palace. My guide informed me that the Feng Shui of the Palace is off because it cuts off one of the main roads in Ho Chi Minh City. 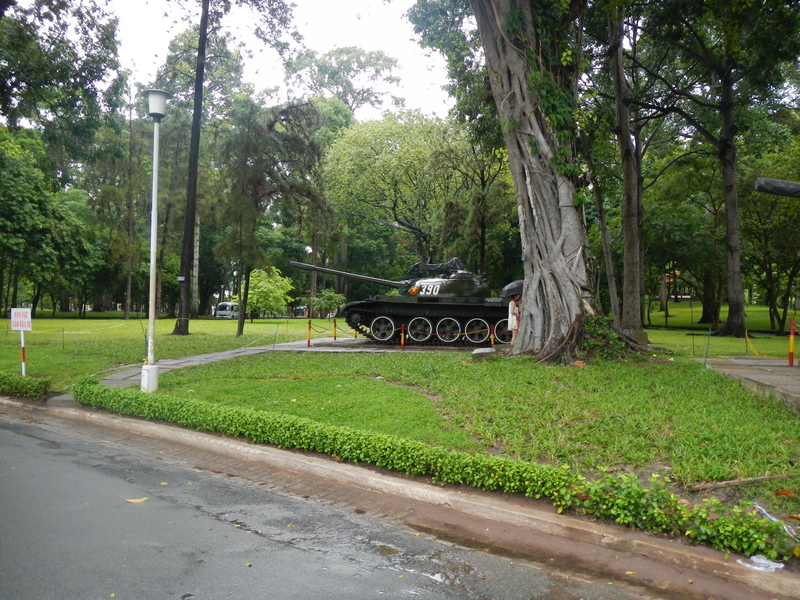 Some Vietnamese believe this is why the Presidents who resided here, were always short lived. Up the tree lined street is the beautiful Notre Dame cathedral. It was built during the French occupation between 1860 – 1863, and it’s towers stand at 58metres high. Amazingly, all the building materials were imported from France. This little piece of French beauty sits serenely amongst the chaos of the traffic, a place of solitude. 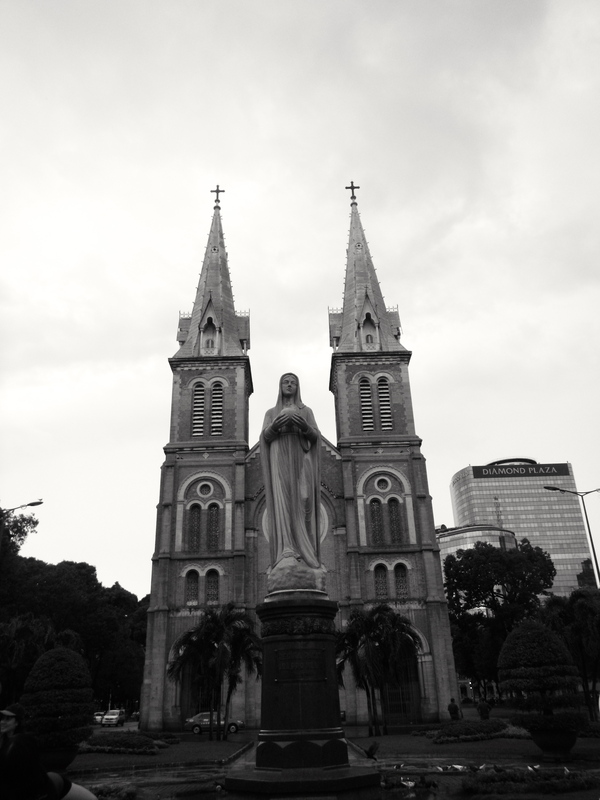 The statue of Mary was erected in 1959 after Bishop Joseph Pham Van Thien attended the Holy Mother Congress. 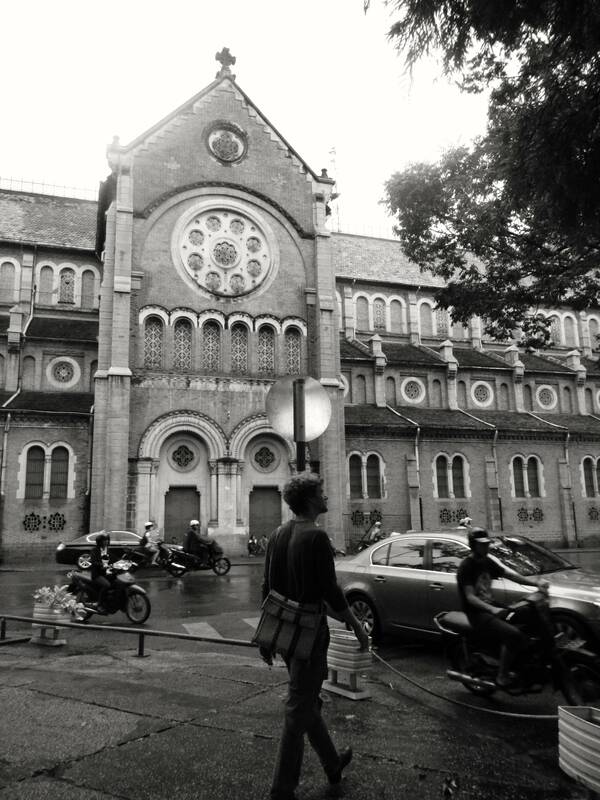 Ho Chi Minh is a city of juxtapositions. The dirty and seedy contrasted by beauty and sanctuary. Next stop, a traditional water puppet show and dinner cruise.